Between the years 1866 and 1871, several attacks were launched against Canada by a secret, Irish, fraternal organization based in New York City, known as the Fenian Brotherhood. The goal of the group was an independant Ireland, and they hoped that by launching attacks against Canada, one of two scenarios would result. In the first, they believed the Crown would offer freedom to Ireland in exchange for and end to their occupation of Canada. Failing this, they believed a large number of British troops would be deployed to Canada to meet their threat, thus allowing the people of Ireland to rise up against a much smaller British force at home. Most of the Fenian raiders, who took part in the Irish invasion of Canada, were Civil War veterans, many of whom wore uniforms made up of civilian clothing mixed with pieces of Confederate or Union uniforms. A number of the raiders also carried their weapons from the Civil War, and many were combat experienced men. The Fenian leadership decided their first target would be Campobello Island, located in the Bay of Fundy, near the entrance to Passamaquoddy Bay. In April, 1866, nearly one thousand Fenians began to meet in Maine, to begin planning their raid. As was often the case with the brotherhood, poor planning led to the men arriving several weeks before their weapons, which were being transported to Maine onboard a former Confederate ship, the Ocean Spray. While the Fenians were waiting in Maine for their arms to arrive, their large numbers alerted authorities on both sides of the border. Nearly five-thousand men from the militia of New Brunswick were posted along the Saint Croix River, and the Royal Navy dispatched six British warships to the area. Michael Murphy, a Toronto based Fenian member, had been ordered to travel to Maine with a contingent of men. The telegram giving him his instructions, however, was intercepted, and Murphy and his men were arrested when their train stopped in Cornwall, Ontario. The mayor of Cornwall, supported by soldiers, seized weapons, ammunition and cash from Murphy and his men, and remanded them to the local jail, charged with treason. Despite the presence of the Canadian militia and the British warships, U.S. General George Meade and seven hundred American soldiers arrived in Maine, and dispersed the Fenians before they could launch their assault. When the Ocean Spray docked in Eastport, the five hundred rifles on board were seized by Meade's men. Although a few shots were fired at Campobello, there were no casualties, and the only damage incurred was the burning of several buildings and the theft of a British flag. A customs warehouse was also destroyed on Indian Island, before the Fenians were driven off by sailors from one of the British ships. Soon after, the Fenians began to slowly make their way back to New York, where many demanded payment for their involvement in the campaign. The wages for the raiders came to $40,000, paid from the Fenian treasury. The Campobello raid showed the Fenians to be ill prepared, with incompetent leaders, but the organization was still considered a threat. Some criticized the British for overreacting by sending the six ships, and many believed that General Meade's intervention meant the United States would not permit any raids to be launched from their soil. In Buffalo, New York, British Consul H.W. Hemans even went so far as to declare that "Fenianism is all but dead". Michael Murphy's trial was scheduled for September 1st, but he escaped with five of his followers, fleeing across the border into New York State. He remained in Buffalo for the rest of his life, where he became a hotel owner, and eventually died of tuberculosis. 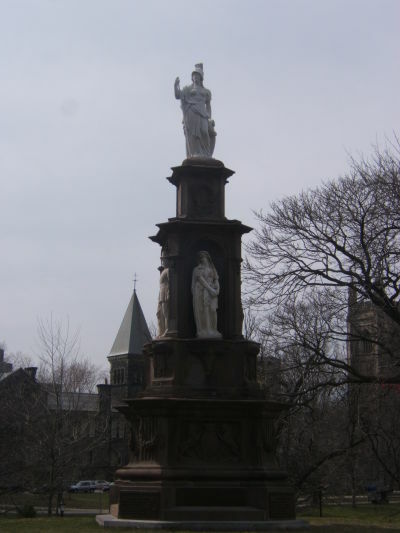 Battle of Ridgeway Memorial, Toronto. On June 1st, 1866, more than eight hundred Fenians crossed the Niagara River, from Buffalo, and landed near Fort Erie, Ontario. Calling themselves "The Irish Republican Army", this group of Fenians were under the command of "General" John O'Neill, an Irish immigrant who had served in the United States Cavalry during the war. O'Neill and his raiders encountered no resistance on Canadian soil, seizing the town of Fort Erie, and immediately cutting telegraph wires. They destroyed a railway bridge next, stole a number of horses, and then demanded that the citizens of Fort Erie feed them. The Fenians set up a camp a few miles north of the town, and several men were sent into the surrounding area as scouts. In response to the raid, British troops and Canadian militia had been called out. Over four hundred militiamen from the Toronto based Queen's Own Rifles boarded a ferry, sailing to Port Dalhousie. Commanding the British soldiers was Major General George Napier, whose first objective was securing the Welland Canal, a shipping channel that connected Lake Erie and Lake Ontario. At Port Dalhousie, the northern end of the canal was secured by men under the command of Colonel George Peacocke. Soldiers under Lieutenant Colonel Alfred Booker secured the south entrance to the canal. With 1,700 militia men under his command, Peacocke's strategy was to march south to Stevensville, a few miles west of the Fenian camp. Lieutenant Colonel Booker would travel by train, with 850 troops, to Ridgeway. They would then travel on foot, meeting up with Peacocke's men, and together, they would engage the Fenians. Although Booker and his men arrived on time, Peacocke's troops were late starting their march, and took a longer route than planned. Booker's troops disembarked at the Ridgeway railway station early on the morning of June 2nd, and began to march north towards Stevensville. O'Neill was aware of the movements of the Canadian militiamen, thanks to his scouts, and was determined to avoid a battle with the combined armies. Just north of Ridgeway, on the Lime Ridge Road, the Fenians threw up barricades and positioned themselves strategically on the ridge overlooking the road. At 8am, the militia under Booker's command were ambushed by the Fenians. Seeing several Fenian scouts mounted on horses, a militiaman reported the presence of enemy cavalry. There was chaos and confusion, as some of the militia troops fell back, and others formed themselves into a square, preparing to repel cavalry which didn't exist. The militiamen were also coming under fire from Fenian sharpshooters, and Ensign Malcolm McEachern became the first Canadian fatality when he was struck in the abdomen by an enemy bullet. The skirmish lasted for two hours, when Booker ordered a retreat. He had suffered casualties of ten dead, and 57 wounded. All of Booker's casualties in the battle were members of the Queen's Own Rifles, including three young men who were University of Toronto students. The Fenians lost ten men killed, and an unknown number wounded. O'Neill and the Fenians retreated to Fort Erie, where they encountered another small band of Canadian militia, artillerymen, and sailors from the Dunnville Naval Brigade. Commanded by Lieutenant Colonel John Stroughton Dennis, the soldiers had requisitioned the tugboat W.T. Robb, sailing from Port Colborne, with the goal of heading off a Fenian retreat. Docking at Fort Erie, Dennis came ashore with seventy men, expecting to meet a handful of fleeing Fenians, being pursued by Booker's troops. Instead, he encountered O'Neill and his IRA, which outnumbered his militiamen ten to one. 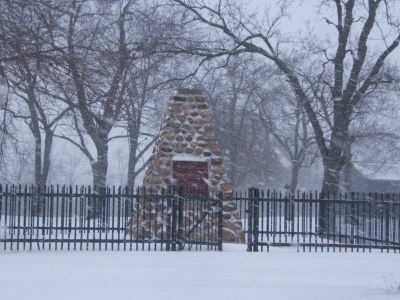 On the afternoon of June 3rd, a bloody battle was fought in the streets of Fort Erie, and although the fighting lasted only half an hour, four Fenians were killed and another ten injured. Six of the Canadians were killed, and more than fifty captured. The remaining Canadian militia retreated to their tugboat, leaving behind Lieutenant Colonel Dennis, who was forced to hide at a nearby farm. Although Fort Erie was again occupied by O'Neill and his army, Peacocke and his force was approaching from the north. On the Niagara River, the gunboat USS Michigan was patrolling, ensuring that no reinforcements could reach O'Neill. Under cover of darkness, on June 3rd, O'Neill ordered his men to retreat to the United States, but most were apprehended by U.S. Navy personnel trying to cross the river. On June 7th, 1866, four days after John O'Neill's retreat from Fort Erie, a second raid was launched against Canada. In this attack, 1,800 Fenians under the command of Samuel Spiers captured the villages of Frelighsburg and Saint Armand, on the border between Quebec and Vermont. Although the goal of the raid was to capture Montreal, the attackers remained in the captured villages instead, awaiting reinforcements. Again, through poor planning, supplies which were supposed to be coming from St. Albans, Vermont, were seized by U.S. authorities. The two small villages were plundered by Spiers and his men, who were then ordered to return to the United States. Defying Spiers command, several hundred Fenians who stayed in Quebec were soon driven back by local volunteers, including a "cavalry" unit formed at the Montreal Hunt Club. In the minor skirmish, only one civilian casualty was recorded, and Spiers was able to avoid arrest upon returning to Vermont. In May, 1870, four years after being driven back to the United States, Spiers again launched an attack in the same area, this time under the command of John O'Neill. Since his last raid, the colonies of British North America had united, forming the new Dominion of Canada. Although British troops were being withdrawn, Ottawa had passed the Militia Act in 1868, authorizing the recruiting and training of a 40,000 man strong army. The outdated weapons carried by the militia in previous campaigns had been replaced by newer, more modern rifles purchased from British and American manufacturers. In the villages of Frelighsburg and Saint Armand, the farmers who had lost much in the previous raid had now armed themselves with Ballard sporting rifles, in the event of a second Fenian attack. In Franklin, Vermont, a few miles from the Canadian border, O'Neill had amassed 15,000 weapons, several thousand rounds of ammunition, and a small artillery piece. With the capture of Montreal again the Fenians goal, O'Neill was disappointed when only 400 Fenians reported for the raid. 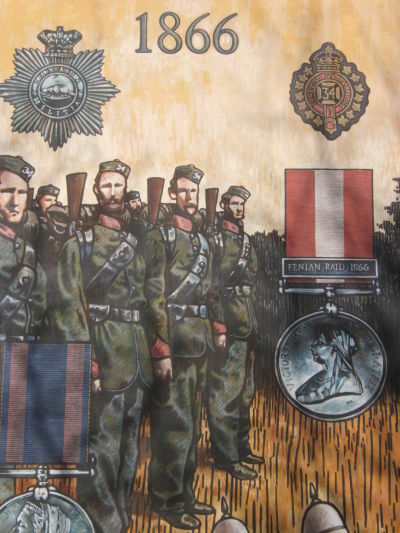 On the morning of May 25, 1870, O'Neill and his small band marched for the Canadian border. Crossing at noon, the Fenian raiders came under fire from area farmers and men of the Missiquoi Home Guard, who had occupied the strategic heights at Eccles Hill. Under the command of Lieutenant Colonel William Osborne Smith, local militia units had also been positioned along the border. Reinforcements arrived at Eccles Hill two hours into the battle, when the Montreal Cavalry and the 3rd Victoria Rifles bolstered the Canadian defences. After fleeing back into the United States, O'Neill was taken into custody by U.S. Marshalls, leaving Spiers in command. The Fenians also received some reinforcements, with one hundred men from the 4th New York Fenian regiment arriving. The attackers also began to move their artillery north from Franklin, and when Smith learned of this, he immediately positioned the men of the Victoria Rifles on high ground, and ordered the Missiquoi Battalion to lead a charge against the enemy. The Fenian attackers immediately began a retreat towards the American border, leaving four of their men dead. A fifth man, "Captain" Corman, a Civil War veteran, later died of his wounds suffered in the battle. The Canadians recorded no casualties. Less than three years after Confederation, the Battle of Eccles Hill was the first attempt at invasion of the new Dominion of Canada. Having learned from the attacks on the Niagara frontier in 1866, the young country and its army was able to successfully defend itself. For violation of U.S. neutrality laws, John O'Neill, now the president of the Fenian Brotherhood, was sentenced to six months imprisonment.